A tranquil retreat amidst glorious countryside and just 3 miles from the breathtaking North Devon coast and the wide golden sandy beach of Westward Ho! and the attractive old port of Bideford, with its pastel coloured houses alongside a tree lined quay. These three delightful 17th-century cob and stone barns have been stylishly converted to a superb standard and offer the perfect holiday choice for a romantic escape or a family gathering. Each of these spacious properties (refs 25979, 25980 [Winscott Barton Barns: Tumbledown Barn], 25981 [Winscott Barton Barns: Glee Barn]) has its own private garden and lovely country views. There are footpaths from the door, a village shop and choice of inns within 2 miles Take a boat trip from Bideford to the nature reserve at Lundy Island or explore many pretty fishing villages including nearby Clovelly and Appledore. Instow, 3 miles, is a pretty, unspoilt, seaside village with large stretches of sandy beaches and dunes, fishermen’s cottages, shops and a good selection of pubs and restaurants specialising in locally caught seafood. The famous Tarka Trail is located nearby and offers good walking and cycling with bike hire available. There are numerous National Trust properties in the area including Arlington and Hartland Abbey, as well as the RHS Gardens at Rosemoor and Docton Mill. Hartland Quay and lighthouse are well worth a visit and for family fun The Big Sheep and The Milky Way Adventure parks are close by. Golf, riding, fishing, surfing, mountain boarding, karting and high ropes are available locally and the wild beauty of Dartmoor, Exmoor and Bodmin Moors are all within easy driving distance as is the famous Eden Project. 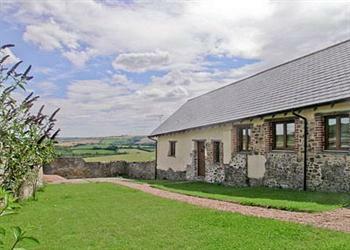 With so much to discover in this lovely part of North Devon, Winscott Barton Barns is the perfect holiday choice. Shop, pub and restaurants 2 miles. All properties: Bed linen and towels included. Freeview TV. DVD. CD. Microwave. Dish washer. Enclosed lawned garden with patio and furniture. Shared 6-acre natural unspoilt grounds. Barbeque. Cycle store. No smoking. Holidays run from Friday to Friday. All on ground floor: Living/dining room/kitchen with French doors, vaulted ceilings and beams. 1 double (5ft) bedroom wtih en-suite shower room and toilet. First amount electric underfloor central heating and electric included, remainder by coin meter. Electric cooker. Hot tub (Apr-Sep).Parking (2 cars). No children under 5 years. For a better idea of where Winscott Barton Barns: Cob Cottage is, you can see Winscott Barton Barns: Cob Cottage on the map below. Winscott Barton Barns: Cob Cottage is in Devon; should you be on the lookout for a special offer, you can find all the special offers in Devon. It's always worth checking to see what is on offer at the moment. Do you want to holiday near Winscott Barton Barns: Cob Cottage (25979), you can see other cottages within 25 miles of Winscott Barton Barns: Cob Cottage; have a look to find your perfect holiday location.